To open any file, you have to find it first; and finding files and folders in Windows Vista is quite simple, using Windows Explorer. If you know where to look, you can follow a path to any file in Windows Explorer. Right-click the Start menu and choose Explore. You can find the Start menu by clicking the Start button at the bottom left-hand corner of the screen. Double-click a folder in the Name field. Double-clicking the folder opens that folder. The folder’s contents are displayed. 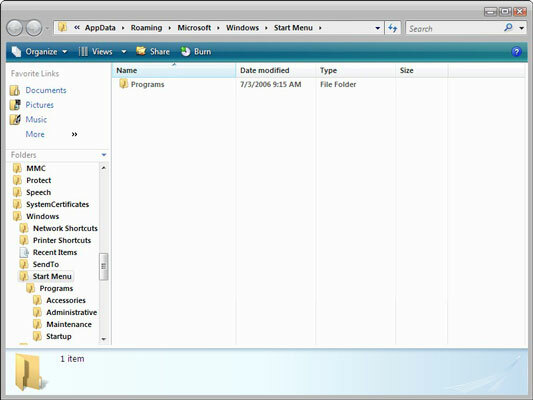 If necessary, open a series of folders in this manner until you locate the file you want. There are some shortcuts to commonly used folders in the Start menu, including Documents, Pictures, and Music. Click one of these and Windows Explorer opens that particular window. When you find the file that you want, you can open it by double-clicking it.